Retailers say making the shopping trip an experience is one way they can drive traffic into their stores. And a little theater in the seafood department is actually helping to drive sales, according to one Northeast retailer, Shoprite, which has added the Shellfish Spa. The device preserves live product such as clams, oysters, mussels, steamers and cockles while presenting them in an eye-catching display. The container bathes shellfish in a continuous stream of saltwater and maintains an ocean-like environment for peak freshness. The waterfall-like display is designed to catch the shoppers’ attention and trigger impulse purchases. “The entire category, for the most part, has never been an impulse buy,” said Tom Olsen, president of Lobster Life Systems, the maker of the Shellfish Spa. He added that clams, oysters and similar inventory is typically displayed on a simple layer of ice. “We’ve taken the little-known category and brought it into a small theater,” he added. Olsen claims that the tank has doubled or tripled shellfish sales while reducing shrink by half in some of the stores that use the spa display. Olsen’s company has placed some of the first Shellfish Spa models in two ShopRite stores owned by New Jersey-based Inserra Supermarkets Inc.
“The shellfish spas, which were installed as part of recent store renovations at the ShopRite of Ramsey and the ShopRite of Hillsdale, definitely help keep oysters and clams super fresh,” said a representative of the Inserra family in an email. While the representative did not agree that impulse buys were necessarily on the rise after the installation of the spas, the representative did believe that they both catch the shopper’s eyes and have contributed to a rise in seafood department sales. The Inserras plan to add shellfish spas to more stores in the near future. 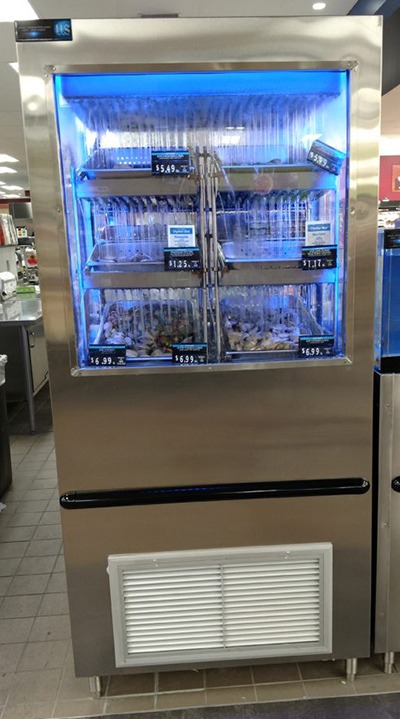 While the Shellfish Spa is still a budding enterprise, Olsen’s lobster tank product can already be found in hundreds of stores, with a significant presence on the East Coast. The tanks are equipped with an emergency reservoir. The water from the main container automatically drains into this sub container during a loss of power. This is important because lobsters require moving water in order to survive in an enclosed environment, as stagnant water does not provide enough oxygenation. The stock is better off in dryer conditions where they can survive for up to eight hours. Presumably—should a blackout occur overnight—members of the seafood department will have returned to work, discovered the power outage and tended to the lobsters before that eight-hour window has closed. ShopRite is a trademark of Wakefern Food Corp., a retailer-owned cooperative based in Keasbey, N.J.. There are currently more than 270 ShopRite supermarkets, and Inserra operates more than 20 of them.